The members of Student Commission voted to dissolve Student Commission effective January 30, 2006. As a result, Student Life worked with students to instead form the Student Government Association (SGA) and the Campus Activities Board (CAB). The change allowed RVC to be more aligned with the national model for student government while allowing CAB to focus on campus activities and event planning. In 2006, Student Life led a campus-wide effort to raise funds and awareness for a national memorial in honor of the Rev. Dr. Martin Luther King Jr., to be dedicated on the National Mall in Washington D.C. 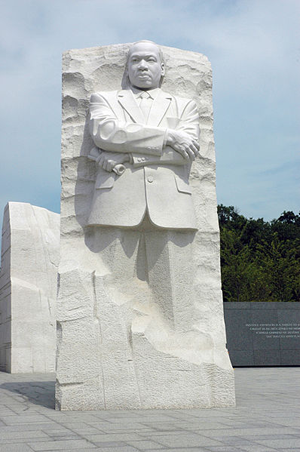 The “Dream Keepers” Campaign allowed college/university students, faculty and staff to remember the legacy of Dr. King by taking an active role in making the monument a reality. The memorial opened to the public on August 22, 2011, after more than two decades of planning, fund-raising and construction. On March 6, 2006, Stephanie Raach, Interim Associate Dean of Professional Programs and Services, and RVC’s Adult Education program received awards at the 26th Annual YWCA Leader Luncheon. Raach was the recipient of the Janet Lynn Award for Sports, and Adult Ed was honored in the category of Non-Profit Organization. The Janet Lynn Award for Sports is presented yearly to a female athlete or to a woman who has promoted athletics. The Non-Profit Recognition Award honors a non-profit organization that contributes to the success of women or families. Contributions are those that continually enhance the roles of women, assist them in responding to new challenges or changing role, address economic or special problems faced by women, and demonstrate commitment to equity. In April of 2006, Diane Koenig was named the recipient of the 2006 Illinois Mathematics Association of Community Colleges Award for Teaching Excellence. She was nominated by Dr. Evan McHugh, who had this to say about her in his nomination letter: “She has been an outstanding asset to the college and this award would further recognize her accomplishments in serving not only her students, but her colleagues, and the entire Rock Valley College community.” Koenig was also the 2005 RVC Faculty Member of the Year. The Rock Valley College Alumni Hall of Fame inducted three new members on April 30, 2006. Karen M. and Steven J. Herdklotz (classes of 1996 and 1985). Karen graduated from the RVC Nursing program in 1996, and Steven graduated from the Electronics program in 1985. After spending 20 years rehabilitating and releasing injured and orphaned wildlife and offering community education programs, Karen and Steve founded “Hoo” Haven Wildlife Rehabilitation & Education Center in 2000. In 2004 the U.S. Fish and Wildlife Services designated “Hoo” Haven an “Eagle Recovery Center.” Karen and Steven provide over 50 educational programs community wide and wildlife rehabilitation courses through Rock Valley College and Kishwaukee Community College. James J. Johnson (class of 1974). His success on the RVC football field led Johnson to a full football scholarship to the University of Idaho. After finishing undergraduate and masters programs at the University of Wisconsin-Stout, he taught at Sparta and then Minnesota’s Winona Technical Institute. Now called Minnesota State College-Southeast Technical, Johnson worked for the college for over 30 years and served as the college’s president from 1995 to 2014. James R. Sullivan (1968-1970). Appearances in Starlight Theatre productions ofPatienceandOklahoma!in 1969 and 1970 highlighted Sullivan’s years as an RVC student. He went on to earn a BA degree in Theatre Arts and English Composition in 1972 from Beloit College. For 22 years, Jim’s passion and commitment to excellence as the well-known founder and Artistic Director of Rockford’s former New American Theater enabled the theater to grow and thrive. His work as a director has been seen and acclaimed in theatres across the country as well as internationally. Hundreds of community members came out to the Rock Valley College Physical Education Center (PEC) on the morning of Saturday, September 30, 2006, to hear then Illinois U.S. 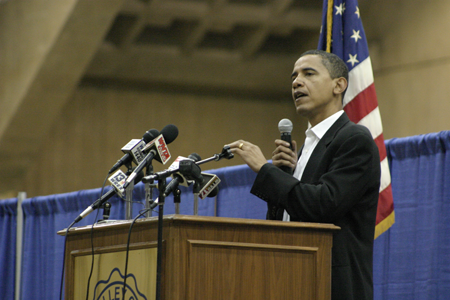 Senator Barack Obama speak at a town hall meeting. Obama conducted what he said was his 57th town hall meeting since taking office in the U.S. Senate in 2004. The crowd, which included Democrats, Independents, labor representatives, students, families and senior citizens, intently listened to Obama’s thoughts on everything from health care to Iraq. Obama began his presidential campaign in 2007 and, after a close primary campaign against Hillary Rodham Clinton in 2008, received the presidential nomination. He then defeated Republican nominee John McCain in the general election and was inaugurated as President on January 20, 2009. Nine months after his inauguration, Obama was named the 2009 Nobel Peace Prize laureate. President Obama is the 44th President of the United States and the first African-American to hold the office. In November of 2006, Jeff Hefty, then Dislocated Workers Program (DWP) Career Counselor, was recognized by the US Department of Labor (USDOL), and the Illinois Department of Commerce and Economic Opportunity, for a Best Practice during a monitoring event. Hefty was given credit for developing a date-finder tool that makes it effortless for counselors to calculate waiver dates for trade-eligible workers, as required by the Trade Act. The USDOL made Hefty’s date-finder available to Trade Act programs in all 50 states. Don’t forget to check our social media platforms for some unique content not seen here!